Women and chocolate. Few food stereotypes are more appropriate – at least in my case. I am someone constantly in search of my next chocolate fix. 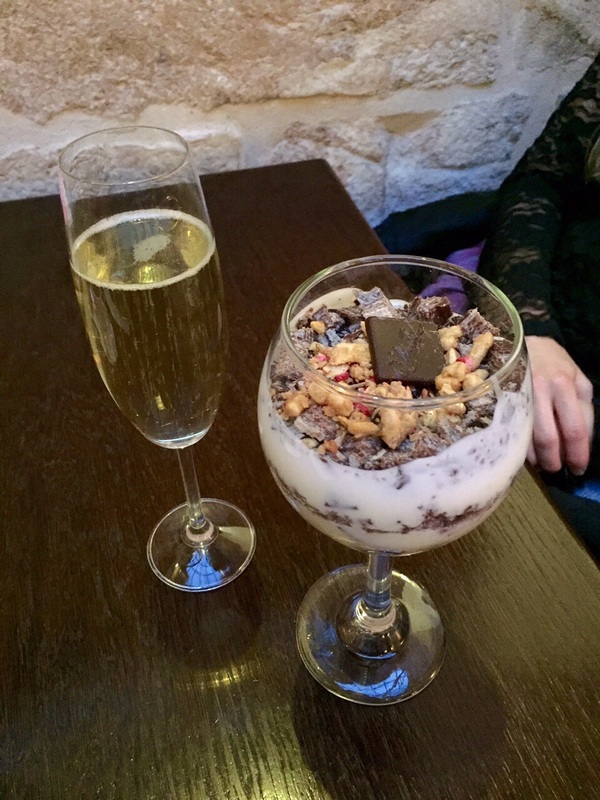 In Krakow, Poland, I did not have to look too hard to find Wedel, a chain of chocolate cafes that feel like the perfect spot to celebrate girls’ day out…or, in our case, Easter. Or anytime when you just need chocolate. Wedel doubles as both an airy cafe and retail shop for their chocolates. The cafe’s menu book is quite comprehensive, and it’s not limited only to sweets. One can make a light lunch of a sandwich and coffee, if not in the mood for chocolate. But why wouldn’t you be? My friend and I made dinner of our chocolate and sweet meal. And what a dinner it was! Choosing between seemingly endless combinations of flavored hot drinking chocolates and more spoon-worthy desserts was tough. Four pages of the menu were devoted to varations of hot chocolate beverages alone. Since Wedel was recommended to us for hot chocolate, we had to try it. I ordered a tasting (or flight) of three hot chocolates accented with fruit or nuts: dark chocolate with hazelnut; milk chocolate with strawberries, and white chocolate with raspberries. My friend ordered the traditional hot chocolate, which was dark and thick. I really enjoyed my hot chocolate flight more than I expected. When I ordered the fruit sampler, I didn’t know what to expect. I assumed fruit syrups or perhaps dried fruit might be present, but Wedel used fresh fruit, which also prevented them from being overly sweet. The bottom of the chocolate-hazelnut tumbler was harshly sweet in comparison to the bittersweet top half – a good reason to stir it with the tiny spoon the cafe provides. The milk chocolate with strawberries was my dark horse favorite. To clarify, I’m not a big milk chocolate person. The darker the chocolate, the better is my philosophy. The white chocolate with raspberries (normally a great combination) was as good as I could have hoped, but I just really liked the sweet strawberry bits with the smooth milk chocolate base. For my main course, I went for the “light side” (a very ironic choice of phrasing on the menu, but I suppose it’s all relative) and chose a yogurt parfait made with granola and chunks of chocolate-covered, layered wafer bars (what else?). Strangely, the yogurt was plain and unsweetened. It could have used just a hint of vanilla and honey, but I suppose my body was happy with me for not going on a sugar binge with one of their ice cream desserts or others. I did not help the situation much by orderig a glass of prosecco, but why not? My friend chose the dessert sampler, which consisted of a hot chocolate soufflé topped with the tiniest scoop of ice cream; vanilla ice cream with strawberries, halwa/halva, and a dark chocolate “straw”; and a “tiramisu” (it was a bit of a stretch) with raspberries soaked in red wine. The souffle was a perfect miniature souffle. I personally did not try the ice cream. The tiramisu had no ladyfingers or cake layer and was solely a white chocolate mascarpone cheese atop a raspberry-wine compote. It actually made for a nice, light, and not too sweet dessert option, if it did not meet one’s expectations for tiramisu . Several other patrons ordered the full portion of it, and few left any trace of it behind. Another popular dessert, which we did not try, looked like a meringue version of strawberry shortcake – strawberries and mascarpone sandwiched between two long, submarine shaped meringues. As the saying goes, we left Wedel – and Poland – fat and happy indeed.